Growing up in the ocean, Kelp has always assumed that he was a narwhal like the rest of his family. Sure, he's always been a little bit different: his tusk isn't as long, he's not as good of a swimmer, and he really doesn't enjoy the cuisine. Then one night, an extra strong current sweeps Kelp to the surface, where he spots a mysterious creature that looks just like him! Kelp discovers that he and the creature are actually unicorns. The revelation leaves him torn: is he a land narwhal or a sea unicorn? But perhaps, if Kelp is clever, he may find a way to have the best of both worlds. •#11 on the National Indie Bestseller list (Children's Illustrated) for the week of February 23rd, 2017. •Indie Next Pick for the Spring 2017 Kids' Indie Next List. 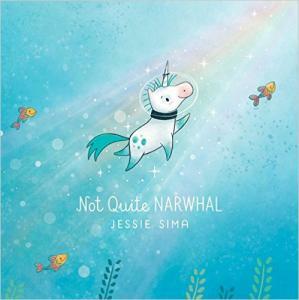 "Newcomer Sima's...adorable characters trigger smiles throughout, whether it's the newborn Kelp tucked snugly into a sea scallop or unicorns using their horns to toast marshmallows. Vignettes show Kelp unsuccessfully imitating crabs ('Oof') and frogs ('Ow') as he tries learning to walk, reassuring readers that they're not the only ones who struggle to master new skills." "Sima...has created charming undersea and overland settings on full-bleed spreads. Her narrative is short, with a storyteller’s pacing and winning characters, resulting in an appealing book. Read it for a whimsical storytime or provide some text-to-text connections for older students with Amy Krouse Rosenthal’s Uni the Unicorn and Bob Shea’s Unicorn Thinks He’s Pretty Great. Verdict: Useful for ELA curricula and sure to circulate, this title is highly recommended."